Indian Premier League 2019: Delhi Capitals (DC) beat Kolkata Knight Riders (KKR) by three runs in the Super Over after the match ended in a tie at the Feroz Shah Kotla on Saturday. 00.20 IST: Kagiso Rabada has done it! The Delhi players are pumped up. What a bowler, what an over. When 11 was needed you surely would have backed Kolkata with the firepower they had but it was Rabada who held his nerves, showed why he is one of the best going around and has ensured the home fans will go home with a smile on their face. Now then, the game firstly should have never come to this point. Delhi were cruising, first they had Kolkata down and out with the ball 61 for 5 but a tremendous recovery courtesy their skipper and Russell with both scoring half tons saw them post a total which all believed to be above par. 00.15 IST: Delhi Capitals (185/6, 10/1) beat Kolkata Knight Riders (185/8, 7/1) by 3 runs in Super Over at Feroz Shah Kotla. 00.08 IST: 10 runs is what Delhi have managed! Kolkata will surely be the happier side now. Just the one bad ball bowled by Prasidh Krishna which was hit for a boundary, on the rest of the deliveries, he was spot on with his variation. Pant never got hit timing right and the question can surely be raised, why wasn’t Shaw sent out to bat. Now though it is on their bowlers to defend this but it will be the visitors who would be the favorites. It is a no-brainer as Andre Russell is the one walking out, the question is who would partner him? Dinesh Karthik? Chris Lynn? Well, it is the former, the skipper is leading from the front and taken the onus onto him. The West Indian will be on strike and he will face Rabada. 00.04 IST: DELHI FINISH ON 10/1. Terrific bowling from Prasidh Krishna. Full and outside off, pretty wide and slower in pace, Pant looks to play the reverse sweep but only gets a top edge. The ball lands in front of Dinesh Karthik. 00.02 IST: Full and wide outside off, Pant reaches out and slices it over cover. Chawla gets across from wide long off and keeps the batsmen to a couple. 23.59 IST: FOUR! Poor bowling. Short and down the leg side, Iyer gets across and just helps it to the fine leg fence! 2 BALLS, 5 RUNS! #ShreyasIyer and @RishabPant777 are out in the middle.SUPER OVER TIME. CHALO BOYS, LET’S DO THIS!!! 23.56 IST: Delhi have thrown it away and out of the blues Kolkata have taken this to the Super Over. 18 were required off 18 but Delhi have somehow lost the plot. Pant played a few reckless shot before giving his wicket away. Shaw after a tremendous innings was unfortunate to miss out on a top by a run. 6 were needed in the last over and Kuldeep and it was Kuldeep who held his nerve and given Kolkata another change to take all two points. Now it is the hosts who will batting first as they were batting second. The two batsmen walking out are Shreyas Iyer and Rishabh Pant. Prasidh Krishna is given the responsibility to bowl it. 23.49 IST: FOUR! Ingram does not think there is any twist in the tale. He belters this short ball on off over mid-wicket for a boundary. 23.45 IST: OUT! Ferguson removes Prithvi Shaw for 99, would you believe it? On 99 Prithvi does not look to run it down to third man or anything. He looks to pull it over the mid-wicket fence. He top edges it and the ball lobs up high in the air. It goes to the right of Dinesh Karthik. He calls for the catch and takes it. An excellent knock from the young star comes to an end. To the sheer disappointment of the crowd and for him he departs. Is there the twist in the tale? DC need 12 off 9 balls vs KKR, but two new batmen out in the middle. 23.25 IST: FOUR! He will also play the cut shot if you offer width. It is short once again and outside off. Shaw waits for it and cuts it over point for the second boundary in the over. 23.07 IST: FOUR! No matter who the bowler is tonight, Shaw has no respite for anyone. Welcomes Rana with a boundary. Short and outside off, Prithvi plays it late and through point for a boundary. Ideal start to the over. 23.04 IST: Has that been taken? Gill claims he has but the umpire wants to have a look. 23.02 IST: FOUR! Wow! That one is going into the highlight reel of the season. Full-length delivery on middle the pads, Shaw helicopter flicks it. Yes helicopter flicks it over square leg for a boundary. 22.46 IST: SIX! THAT IS COLOSSAL! Yes, it was a freebie but it still has to be put away! Short and it sits up to be hit. Iyer rocks back and pulls it into the mid-wicket stands. A boundary per over is what they need, they have got their one in this over. 22.40 IST: 50 up for Delhi. A solid start from them. They have lost a wicket but are going about at it with a good run rate. Shaw comes down the track and nudges it towards mid-wicket to get his team’s total to 50. 22.17 IST: FOUR! Too full and on the pads, easy pickings for Shaw. He flicks it through mid-wicket and the ball races away to the fence. 22.14 IST: FOUR! Beautiful shot this from Shaw. Back of a length delivery on off and middle, Shaw rocks onto his back foot and whacks his pull through mid-wicket for a boundary. 6 off the first over for Delhi. 22.04 IST: 64/5 in the first 10 overs. Advantage Delhi. 121/3 in the next 10. Massive momentum swing. This man Andre Russell is just the reason why Kolkata could prove the team to beat this season. An innings of two halves. First saw the visitors complete total harakiri, throwing their wickets away and being reduced to 61/5, amidst some careless batting. But then came Andre Russell and he started to go bang bang. In next to no time, the 50-run stand was raised. And then, Russell got hit on the shoulder. The big man went down but then what followed was a thunderstorm. He started pummeling the bowlers and finished on 62 from 28 balls, with 4 fours and 6 sixes. Do not forget the contribution of skipper Karthik. He came in at 40/3 and was there till the 19th over, scoring 50 himself. In a stand of 95 with Dre Russ, DK scored 27. 21.51 IST: FOUR! ‘You expect better from Rabada. That really is sloppy bowling,’ says an angry Kevin Pietersen on air. A low full toss outside off, Kuldeep backs away and steers it behind point! 21.45 IST: SIX! What a way to get off the mark! Mishra bowls a tossed up the ball on middle, Piyush gets on his knees and sends it sailing into the mid-wicket stands. 21.40 IST: FOUR! Hammered! Morris bowls it full and on off, Andre pulls it to mid-wicket. The ball raced away to the fence like a bullet. 21.31 IST: SIX! BLUDGEONED! Number 5 for Russell. Do not bowl it there to him. Length. Outside off. Cannon. Missile speed. Powered over long on. What a hit. 21.23 IST: FOUR! That is unlucky for Morris. A terrific yorker, outside off, Russell is late to get his bat down and gets an inside edge. But, it zips past the stumps to the fine leg fence! 21.18 IST: Common sense prevails. With the batsman being not too comfortable yet, the second strategic break has been signalled. This particular event could have a telling blow on either side. If Russell does not recover, Kolkata might struggle to get to even 150. On the flip side, if Dre Russ recovers, beware Delhi – 101/5 could end up at 181/5. CHRIS MORRIS IS BACK ON. 2-0-11-0 so far. 21.15 IST: There is a bit of a delay here. Russell is not at all comfortable. The physio is out in the middle, giving him a bit of a rub on the left shoulder. The umpires are having a chat with Karthik, probably asking the physio to hurry up. 20.59 IST: FOUR! That’s a classic pull shot from DK. He reads the lengh early and rocks back to this full ball and pulls it hard to deep mid-wicket and into the boundary. 20.56 IST: SIX! BLAST! There comes number 1. Full and outside off, right in the arc, Russell leans and bludgeons it over long off! 20.46 IST: Strategic break. Wow. An action-packed 9 overs so far. Delhi have stunned Kolkata, taking 4 big wickets but such is the line-up of Kolkata, that there are more to come! Karthik and Gill will be looking to get a partnership going and then set Russell loose to get the firecrackers ablaze. Here comes Sandeep Lamichhane. 2-0-7-1 so far. 20.41 IST: SIX! Terrific shot from KKR skipper! A short ball, on middle, Karthik swivels and pulls it over square leg! 20.28 IST: FOUR! Magnificent cut shot! Short and outside off, Uthappa walks into the shot and plays a lovely cut shot, piercing the gap behind point. Not a soul in place and the ball races away! 20.19 IST: FOUR! Uthappa is off the mark in style! This is floated up around off, it is a little too full. Uthappa leans into it and strokes it through cover-point for a boundary. 20.15 IST: A review this time by Kolkata! Naik has been adjudged LBW but he has reviewed. Only an inside edge can save him. 19.57 IST: We are all set to get underway! The Kolkata openers, Chris Lynn and Nikhil Naik make their way out to the middle. The latter will take strike and he will face Kagiso Rabada. 19.53 IST: A few minutes before there was some rain and the pitch was covered. But it seems everything is clear now and the match will begin on time. 19.38 IST: Delhi captain, Shreyas Iyer, says he wants to bowl first. He reckons the decision to bat in the last game was the wrong deicison and he wants an idea of how the wicket will play. Credits the way how Russell and Pant have been played and he hopes they can keep the former quiet. Informs they have 4 changes, Sandeep Lamichanne, Chris Morris, Harshal Patel and Hanuma Vihari come in. 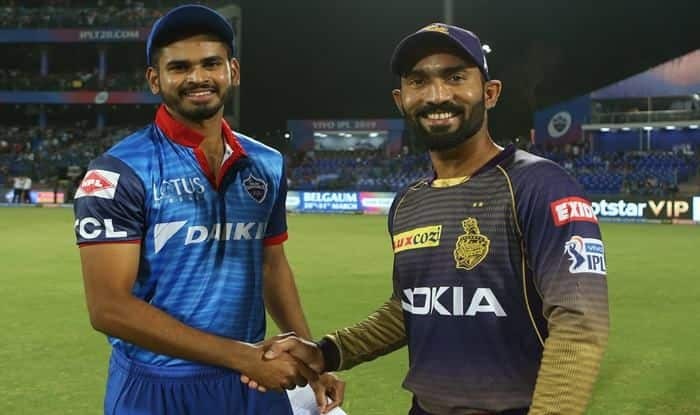 19.32 IST: Shreyas Iyer wins toss as Delhi Capitals opted to field vs Kolkata Knight Riders. 19.20 IST: Delhi Capitals scored at a run-rate of 5.80 against CSK, a stark contrast to the death scoring rate of 16.40 they achieved against MI. 19.15 IST: Hello and a very warm welcome to our live cricket blog of match 10 between Delhi Capitals and Kolkata Knight Riders from Feroz Shah Kotla. Brief Preview: The first week of the Indian Premier League has seen some nail-biting encounters and one team that has ensured edge-of-the-seat entertainment is Kolkata Knight Riders. Having won both their games so far, they have come in the capital to take on the Delhi Capitals in their third game of the 12th edition of the cash-rich league at the Feroze Shah Kotla. While KKR have been on a roll, Delhi Capitals have had a mixed fate. While they thrashed Mumbai Indians in their opening game, they lost to Chennai Super Kings at home in their second game. Going into their third game of the season, DC will want to put the campaign back on track and avoid getting stuck like in the last few seasons. Drafted into the team at the start of the season by DC to cement the batting, India opener Shikhar Dhawan has failed to provide the quickfire starts at the top. While he has scored runs in both the games, including a 50 in the last game against CSK, his scoring rate has left a lot to be desired. In fact, head coach Ricky Ponting accepted after the CSK game that he would ideally want Dhawan to score a little fast so that there isn’t unnecessary pressure on someone like Rishabh Pant. The DC batting has again looked to rely heavily on Pant to provide the finishing touches towards the end of the innings.